We receive many reader inquiries about gunsafes. We often hear: "Look, I know I should get a bigger, more expensive safe, but I just can't spend more than $750". 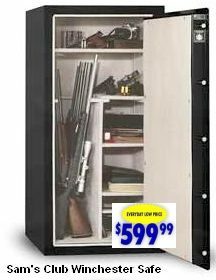 For those on a tight budget, Granite Security builds a quality 60"x30"x20" "Winchester Club Safe" sold at Sam's Club for just $599.99. Weighing 575 pounds, this will be much more secure than the thin-walled "gun lockers" that can cost $300-$400. The interior is about 56" high, long enough for 30"-barreled guns if you use the pass-through in the top shelf. You can use both sides for guns or have rifles on one side and shelves on the other. The safe has a claimed 24 long-gun capacity, but realistically, figure 8-9 per side. At 575 pounds, the safe is heavy enough that it would be difficult for the typical "smash and grab" thief to move. The safe comes pre-drilled with holes for anchor bolts, plus a dehumidifier access hole. The safe has a UL-listed electronic lock, but we recommend upgrading to an S&G or LaGard commercial-grade digital lock (or dial lock). Commercial grade locks offer higher-quality keypads with much enhanced long-term reliability. We've talked to many gunsmiths who say the Sam's Club safe (by Granite), is hard to beat for the price. Click HERE to read comments from many folks who own the Sam's Club gunsafe. One owner writes: "The Sam's Club Winchester safe is essentially a Granite Security Ranger, minus about $300. Probably one of the best values in the safe market today." For general info about gunsafe features, read our Gun Safe Buyers Guide.